The next time you’re tempted to make a phone call while you’re behind the wheel, remember this. Dialing while driving increases the risk of a crash or near-crash more than any other sort of distraction. During the months studied, the drivers got into a total of 73 crashes. 31 among the novices. 42 involving the larger group of experienced drivers. The researchers recorded another 612 near-crashes. A near crash is defined as “any circumstance requiring a last-moment physical maneuver that challenged the physical limitations of the vehicle to avoid a crash for which the driver was at fault or partially at fault.” Crashes and near-crashes involving drowsy drivers or drivers who were under the influence of drugs or alcohol were not included in the analysis. Not surprisingly, the novice drivers got into more trouble than their more seasoned counterparts when they tried to do something other than focus on the road ahead. Compared to periods when they weren’t distracted, the odds of of a novice driver getting into a crash or near-crash were 8.32 higher when they were dialing while driving. 8 times higher when reaching for something besides their cellphone. 7.05 times higher when trying to grab the phone. 3.9 times higher when looking at something on the side of the road (including cars involved in other crashes). 2.99 times higher when eating. For the experienced drivers, the only activity that increased the risk of a crash or near-crash risk was dialing while driving. That made drivers 2.49 times more likely to get into trouble behind the wheel, according to the study results. The researchers also discovered that the more experience the novice drivers logged, the more likely they were to do something other than focus on the road ahead when they were behind the wheel. This might because they become more confident in their driving abilities, the researchers speculated. Parents can help their teen drivers by setting a good example and making sure they don’t dial or text when they’re driving themselves, Simons-Morton said. They should also “let their children know that they should wait until the vehicle is stopped before taking a call — even when it’s from mom or dad,” he added. If you or a loved one has been injured in a wreck due to distracted driving, you need an attorney. Call the Law Offices of L. Clayton Burgess to schedule a FREE case evaluation. 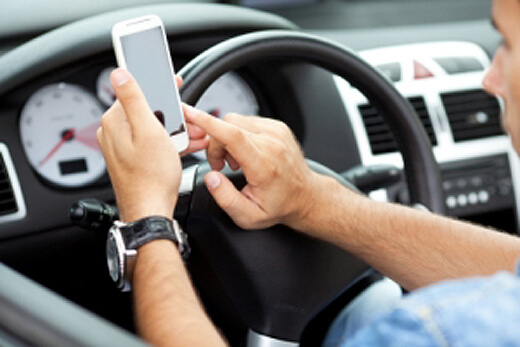 Our car wreck attorneys have experience in accidents caused by distracted driving. Don’t Delay, Call Clay!